Indonesia has the largest Moslem population in the world. For Moslem women, wearing a Hijab (Moslem Head Wear) is a symbol of faith. For today’s young women, it has also become a reflection of their modern, dynamic lifestyle. So, how does a small boutique Hijab store appeal to these young women with a precious little budget? Specially when there is a Hijab shop on virtually every street! The idea tapped into the insight that typically, wearing a Hijab takes a lot of effort. And, a lot of pins. 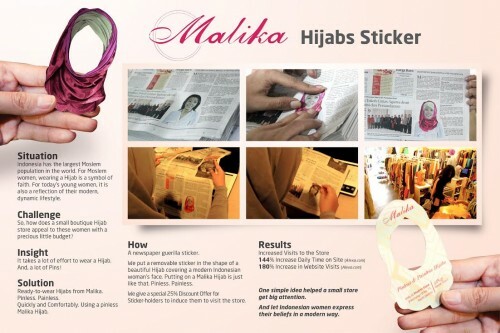 We promoted the Pinless range of ready-to-wear Hijabs by using a newspaper guerrilla mechanism. A news article featuring a modern Indonesian woman was planted as an advertisement in a leading local newspaper. And then, we put a removable sticker in the shape of a beautiful Hijab covering the head of the woman. So, almost instantly she ‘wore’ a Hijab. Which is exactly how the experience of putting on a Malika Hijab is. Pinless. Painless.